Easily change the color of upholstery furniture with Upholstery Fabric Spray Paint. Upholstery Fabric Spray Paint by Simply Spray® is a non-toxic, non-flammable aerosol paint for use on absorbent materials. It is a cheap and simple alternative to re-upholstering furniture. Once applied, the paint gets absorbed by the fabric and does not change the feel or flexibility of it. The paint dries softly. Technically it is a paint but it acts more like a stain or a dye. The color of the paint is permanent, fast-drying, and will not rub off once it is dry (which takes a suggested 72 hours). For best results, first ensure the absorbency of the material you wish to spray by testing a small area with water. If the water beads up then the upholstery paint will not work well. You would want to then use the Outdoor Paint. 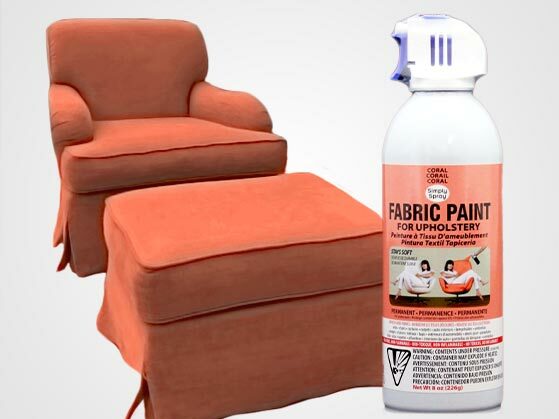 Outdoor Fabric Paint is waterproof and works on more fabrics, but it does not dry softly like regular upholstery paint does. Before painting, read all the step by step instructions, make sure the material is dry and free of oils, waterproofing, stain resistance, and loose dirt before painting. 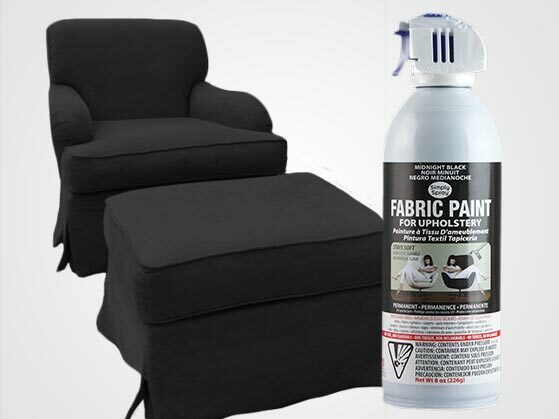 Our Upholstery Fabric Paint formula has a UV blocker to help prevent fading from the sun. It is perfect for your soft fabric cushions. Use this paint to changed the color of car interiors, auto carpets, office cubical partitions, patio furniture, sofas, chairs, couches, recliners, office furniture, draperies or any absorbent materials. It does not work on fabrics that have had stain resisters or waterproofing put on them. If you have any questions about if this paint will work on your project, please contact us. We are happy to help you. Available upholstery paint colors are Midnight Black, Saddle Brown, Lavender, Periwinkle Blue, Navy Blue, Charcoal Grey, Hunter Green, Burgundy, Bright Red, Burnt Orange, Hot Lime Green, Plum Purple, Caribbean Blue, Coral Peach, Sage Green, and Camel Brown. When choosing your colors we suggest you go darker than the original color and stay in the same color family. Patterns and stripes will show through. Here is a DIY blog about painting upholstery fabrics. We wouldn't have suggested painting wool blends. That is why she used so much paint. If you have any questions about using upholstery fabric spray paint please do not hesitate to ask us.